Get your business more exposure and meet local business owners at our first Business Expo at the Grand Casino in Shawnee. Have you seen the traffic at the Grand? This is a great opportunity to network and get inspiration from fellow business owners as well as market your business all while having fun! There will be exhibit door prizes, games and a cash bar. You can even try your luck at the slot machines! 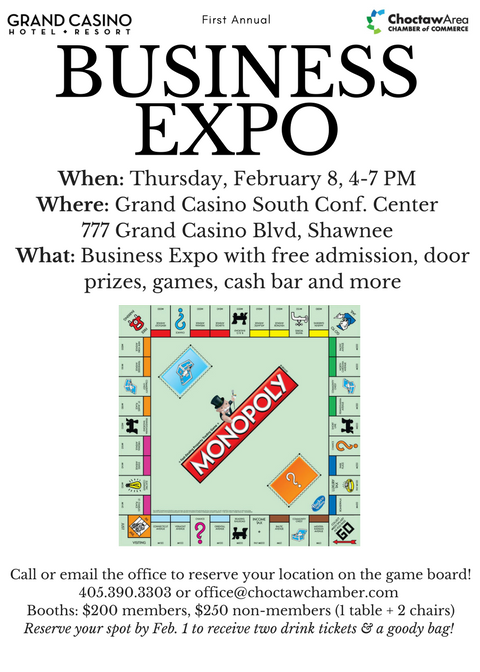 Call or email the chamber office to reserve your spot for our Monopoly-themed Business Expo.